Rich Durnwald helps business owners and successful professionals find the time to make smart decisions about money. Rich Durnwald does this by helping to identify and prioritize the values that each individual brings to the table and compare them to the financial actions they are currently taking. Rich creates an atmosphere that allows people to focus their time and energy on their families and businesses without fear that their financial future may be in doubt. The result is that Rich's clients utilize financial solutions that allow them to accomplish the things that are truly important to them. Let Rich Durnwald help you achieve a secure financial future. My mission is to help clients achieve financial security so that they are free to lead lives that maximize their full human potential. I will help identify my clients' needs and provide services that supply the highest value consistent with their planning horizon. Contributing to the community is a way of life for Rich Durnwald. 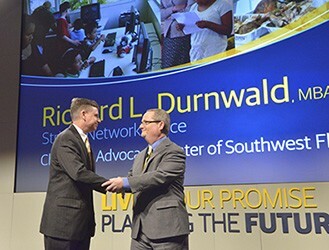 In honor of the work he does with Children's Advocacy Center of Southwest Florida, Durnwald has been awarded the 2014 Community Service Award by the Northwestern Mutual Foundation. The award is presented annually to 16 Northwestern Mutual financial professionals who demonstrate exemplary service with a local nonprofit. As part of the award, Children's Advocacy Center of Southwest Florida will receive a $15,000 grant from the Foundation in Durnwald's honor. Rich Durnwald would like to introduce you to a website sponsored by Northwestern Mutual Financial Network that is designed for a very important group of people in our lives . . . our children! Learning to handle money wisely is a lesson that desperately needs to be learned at a young age. Our kids, grandkids, nieces, and nephews are the ones that will be shaping our world in the near future!